Happy Feel Good Friday and Happy April Fool's Day! I can't think of a more appropriate organization to share with you today than the Faithful Fools Street Ministry in San Francisco. Founded on April 1, 1998 by Unitarian Reverend Kay Jorgensen and Sister Carmen Barsody, the mission statement of the organization is, "We discover on the streets our common humanity." Located in the Tenderloin neighborhood, Faithful Fools seeks to "meet people where they are". They advocate for people facing displacement as well as register, educate and mobilize voters in the neighborhood. In their offices at 234 Hyde Street, they offer meditation space as well as writing, clowning and art classes. The most unique programs they offer are Into the Streets and Street Retreats. The first program is a mid-day walk through the neighborhood that happens the 2nd Friday of each month and is designed to show people that, "when we walk the streets, the life around us is a mirror, reflecting back to us our humanity, our frailties and our strengths." The second program is a one day retreat that happens the 4th Saturday of every month. It starts with reflective readings, songs and an orientation, then you spend the day on the streets of the Tenderloin before coming back to share your experience with others from the morning group. There is also a 7 day, 6 night version. To understand why people with homes choose to sleep on the streets you can read this blog. 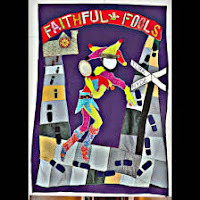 If you want to learn more about the Faithful Fools you can read their annual, downloadable magazine called Fools Fables which will answer all your what, why, how questions. You can also visit the website to participate in their programs and like their Facebook page, because you know Facebook is full of fools.